Ancient Arts ~ Germanic, Viking and Medieval jewellery and carved stones that inspire you with the mystic beauty and heritage of the ancient peoples of Northern Europe. 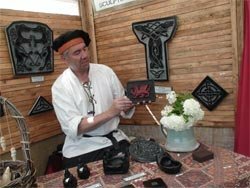 Celtic & Medieval Stonework ~ Duncan MacDonald makes beautiful wall scultptures of celtic knots and authentic old medieval designs. David Rankine ~ Canada's best known Contemporary Celtic Artist. 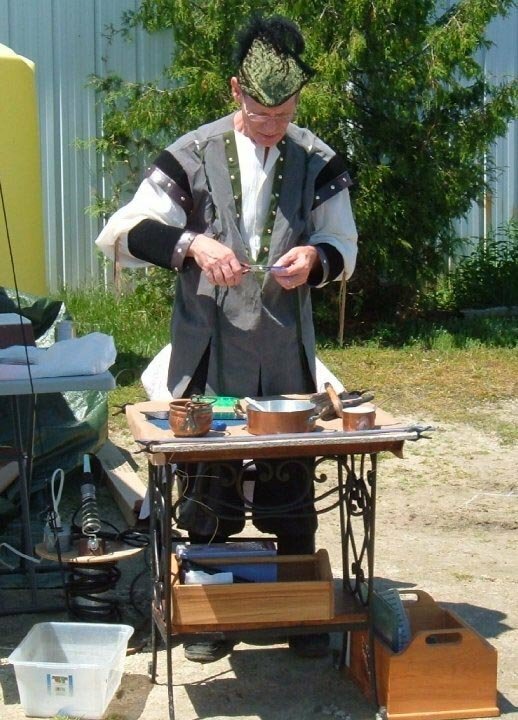 He plays the medieval Dulcimer and will be playing on stage. Not a guy to miss! Dragonfire Studio ~ A multi-media studio, hand crafting art from metal, glass and feathers. Something for everyone! Earthbling ~ Jewellery crafted from natural materials like wood, leather and minerals. Jim's Chainmail ~ Chainmail jewellery and faerie wings. Ken's Glass Act ~ Stained glass suncatchers, panels, custom orders, fused glass, and fused jewellery. He'll be doing an amazing on-site stained glass demo on the Education Days. Linda Laforge ~ Artist Linda Laforge offers paintings of prints of characters from Celtic and Medieval Folk Lore. Personal Power Palmistry ~ Your future is in your hands, and that's where this medieval psychic will see yours! Seams Like Olde Tymes ~ Affordable costumes and accessories for men, women and children. Sheboa Pottery ~ Rustic stoneware with a historic flare. Shadowsand ~ Design you own unique sand bottle from 18 colours of sand. An olde tradition from the Isle of Wight. Hand made tapestries and medieval wall hangings. Stitching Past Time ~ make & sell historical and fantasy costumes, plus accessories with a magical touch. Soft cloth dolls & stuffed toys. Food Vendors offering great bites, like hot dogs, burgers, fries and pizza. Sweets, treats, awesome Popcorn and drinks also on hand. Merchant Applications still available... but not for long. Due March 25th. Artisans can download Merchant Applications here now. It includes requirements, fees, set-up and take down information as well as show hours. Click here to download your Merchant Application. It's a 375kb PDF. Apply today! We're past deadline, but still accepting those who fit the era.